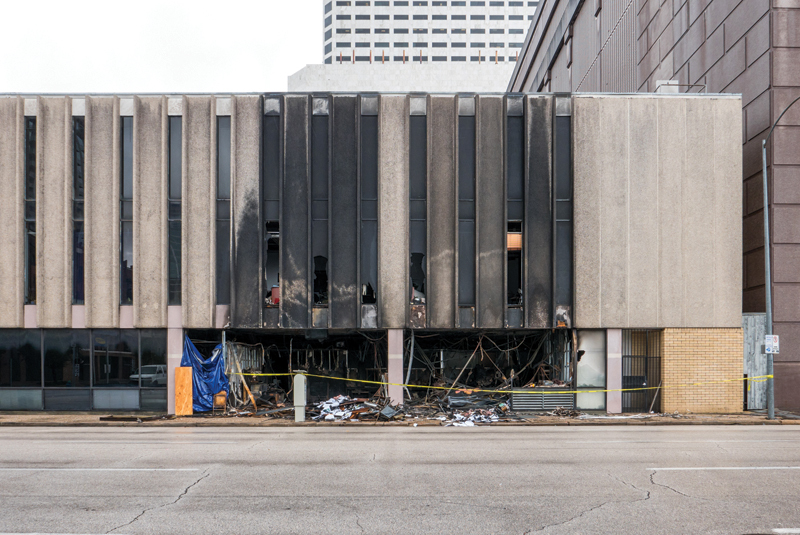 The offices of Lone Star Legal Aid in downtown Houston caught fire during Harvey. Photo by Peter Molick. There is a small crack in the flashing around one of the pipe vents that protrudes from my house’s metal roof. It’s not a problem unless the rain is really torrential. In the two-plus years I’ve lived in Austin, there have been quite a few frog-chokers, but the flashing has only leaked once — during Hurricane Harvey. The water came in at a trickle, ran horizontally across the attic ceiling, and dripped down into the blown cellulose insulation. Once saturating a 2-ft-diameter area, the water ran horizontally again, this time across the interior ceiling, and found a seam above one of the kitchen cabinets. From there it dripped down into my heirloom Wedgewood teacups, overflowing one and spilling out of the cabinet in drops onto the countertop’s chunky, painted Mexican tile. A singing bird on one of the tiles got its beak wet. My cousin in Houston sent me a video she took of Shepherd Drive near I-59. It was a lake, the water lapping at the grass. She was freaking out. Her dad was inside, making omelets — unconcerned, so far. It was just another hurricane, after all. They’d been through it many times. And he had been to the liquor store before the rain started, leading my cousin to quip that it is the family way to “make cocktails while the house is on fire.” Of course, Harvey wasn’t just another hurricane. The rain kept coming. Over the next few days it dumped, by some counts, 11 trillion gallons on the area. By Shepherd and 59 the water kept rising. It came up nearly to my uncle’s doorstep before stopping and eventually draining away. He and my cousin were not there for that part. Earlier, they’d gone out in the SUV to relieve a bout of cabin fever, got cut off from home by the flood, and fled to Dallas. Elsewhere in the Houston area, things got much worse. Nearly 50,000 homes were flooded. Many residents were displaced into shelters. Some buildings caught fire and burned, creating one of the uncanniest sights of the storm: a house burning in a lake. The destruction of property in Houston alone is estimated at $50 billion (accounting for the entire region raises that number to $180 billion). People — more than 70 — were killed, directly or indirectly, by the hurricane. The number of storm dead could increase in the years to come, because the flood waters carried pollutants that are dangerous to human life: Toxic chemicals were unleashed from petrochemical plants, and dioxins from an old paper mill were uncovered from a previously capped superfund site. The water distributed these killing agents among the people, spreading the wealth like a post-apocalyptic Robin Hood who hates humankind in general. The homeowners themselves were quite surprised to discover that their neighborhood was built on land designed to flood. Nobody ever told them that: not the county, not the municipal utility districts that make up these neighborhoods’ de facto governments, and certainly not the real estate brokers who sold them the properties. These residents have expressed anger at the county. They’ve pointed fingers at the Corps for not buying up the land in the first place (the funds were not made available, the Corps explained). But shouldn’t accountability also be placed on the people who developed the land to begin with? Certainly they knew it was flood-prone. And since we clearly can’t trust developers to act in the public’s best interest, shouldn’t the government intervene? Boosters brag about the affordability that has come from Houston’s deregulated development practices, but what is an affordable home worth when it is set up from the start to fail?